Landforms define the shape of the terrain. Let's take a look at an existing landform. There are 2 system at work that let you control the shape of the terrain - the octaves and the Y-Thresholds. This causes the 7th octave to be only active 30% of the time, as most of it is substracted away. Note: The amount of octaves is always fixed at 10. You can't configure less or more than 10. In this example at maximum world height the density is 0, so there will always be air blocks. In the middle we have a jump where the y-position changes, but not the density, so this will create cliffs in the mountain. On the lower end the opposite happens. The Y-Position changes very little but it's density increases a lot. If that position happens to be at the sealevel we would get flat beaches. 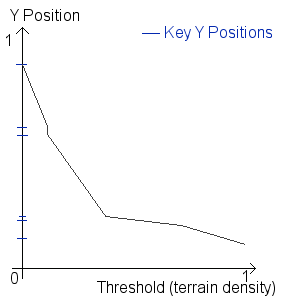 The default sealevel y-position is 0.43 And below a certain y-position the density is always 1. If we would set that to a lower value, we would get very deep lakes. The amount of configurable Y-Thresholds is arbitrary you may use any quantity, just make sure both lists have the same amount of elements. However, it wouldn't make sense to configure more than 256 thresholds for a world height of 256 blocks. This page was last modified on 30 March 2019, at 20:25.